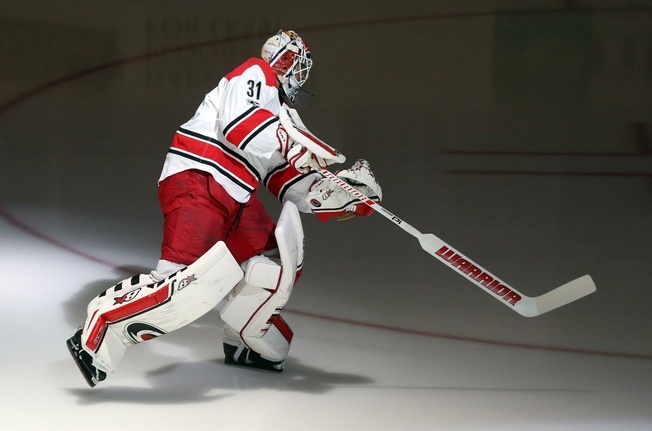 The Carolina Hurricanes have traded goalie Eddie Lack, defenceman Ryan Murphy and a seventh-round draft pick for the 2019 NHL Entry Draft to the Calgary Flames in exchange for Keegan Kanzig and a sixth-round draft pick for the 2019 NHL Entry Draft. According to reports, Carolina is retaining 50 percent of Lack’s salary. The 29-year-old Swedish netminder has a year remaining on his current deal with the Hurricanes, but he was clearly the odd man out when it came to their goaltending situation. Carolina acquired Scott Darling from the Chicago Blackhawks and that created a crowded picture in net, with Cam Ward still a fixture. Lack went 8-7-3 in 2016-2017, with a 2.64 goals against average and a .902 save percentage. He posted one shutout. Lack saw a reduction in his playing time in Carolina, where he arrived after two seasons with the Vancouver Canucks. The Hurricanes used him as a backup in the purest sense of the term, while the Canucks had him splitting the starting gig with Ryan Miller and Roberto Luongo. In 136 career games with the Hurricanes and Canucks, Lack is 54-51-18 with a 2.56 goals against average and a .911 save percentage. Defenceman Murphy was drafted by Carolina in the 2011 NHL Entry Draft and has played 151 games for the club since 2012-2013. He had just two assists in 2016-2017, suiting up for 27 games. The Flames will clearly see some changes in goal this season, with Brian Elliott on the way via free agency and Mike Smith a new hire. Adding Lack to the list is a wise move, especially with Carolina handling half his salary. Lack won’t field a lot of games in the Calgary net, mind you, but he will prove a reputable backup with Smith capable of fielding a lot of starts. In Kanzig, the Hurricanes get a 22-year-old defenceman without a minute of NHL experience. He skated with the Adirondack Thunder and the Stockton Heat this season and was drafted by Calgary in the third round of the 2013 NHL Entry Draft.